Whenever we stroll into some place that is posh, most of the time, there would be a chandelier that is hanging around literally, right at the top in the middle of a vast hall, resplendent in its beauty. How about when the entire event is over, and you try your very best to make your way back to your ride while trying to counter the after effects of having a little bit too much to drink? That is where you add a dash of “corny” to your vehicle with the $10.99 Cardelier. 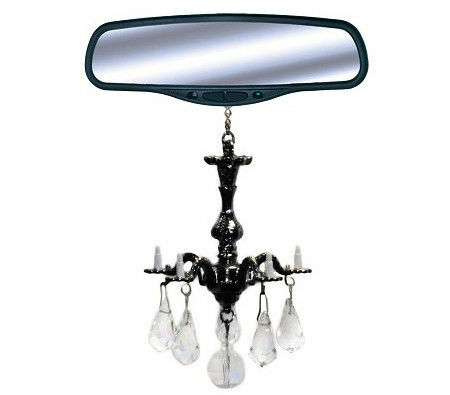 The Cardelier will arrive in black, where it hangs over your rear view mirror while twinkling in the sunlight and moonlight like a crystal lit 18th Century Ballroom.